In addition to writing and editing, I am also a professional astronomer. 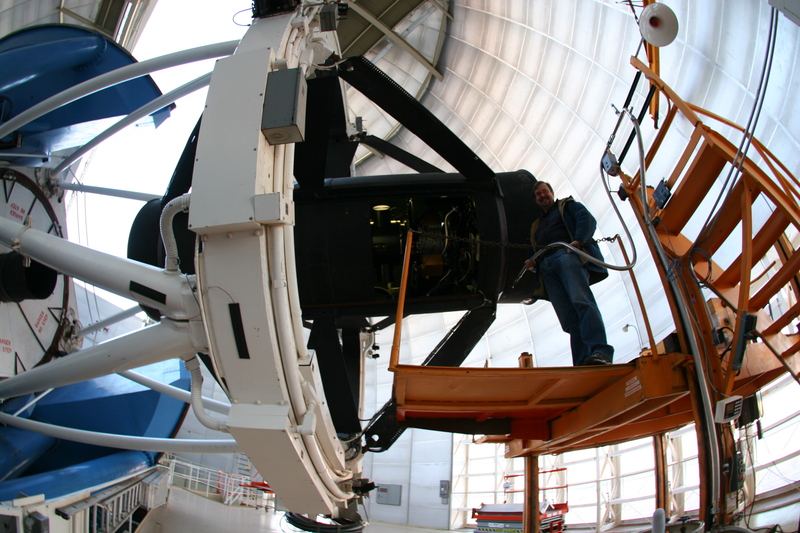 Currently, I work as an Observing Associate at Kitt Peak National Observatory where I operate the Mayall 4-meter and WIYN 3.5-meter Telescopes. In the top photo on the right, you can see me preparing the Mosaic CCD Camera for a night's operations in a wonderful fish-eye view courtesy Jim Scotti of the University of Arizona's Spacewatch Project. 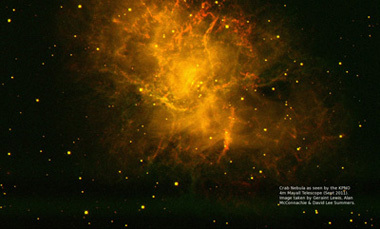 The photo below shows the Crab Nebula as seen by that same instrument and telescope. Clicking the images will bring up full-size versions. I have a bachelor's degree in astrophysics from the New Mexico Institute of Mining and Technology. On the way to that degree, I worked at Maria Mitchell Observatory on Nantucket Island and also at the Very Large Array in Socorro, New Mexico. I started graduate school at New Mexico Tech where I was involved in researching novae and supernovae. I then transferred to the University of New Mexico, where I pursued studies in stars with active atmospheres. During this time, I discovered two variable stars. My career path in astronomy shifted focus from pure research to telescope support and engineering. After graduate school, I went to work at Kitt Peak for three years. After that, I was hired by the Astronomy Department at New Mexico State University to help bring their 1-meter Telescope at Apache Point Observatory on line. Once the telescope was functioning as a reliable research tool for the university, I took some time off to focus on my writing and editing career. In 2008, management at Kitt Peak National Observatory contacted me and asked me to return. I have been with the observatory since that time. For those who have an interest in such things, I have compiled a list of my scientific publications.